NAIROBI, Kenya, November 19, 2013/ — The Board of the African Development Bank (http://www.afdb.org) on Wednesday November 13th approved US$120 million financing for the Nairobi Outer Ring road project which involves the improvement of the existing single carriageway road to a 2-lane dual carriageway complete with service roads, grade separated intersections, pedestrians–foot-over bridges, walkways and cycle tracks over the entire length of the road. The 13-kilometer project, on completion is expected to directly enhance the traffic circulation and eliminate traffic bottlenecks to various economic activity centers such as the industrial zone, and the vast populous residential areas of Eastlands. AfDB Regional Director for Eastern Africa, Mr. Gabriel Negatu confirmed the financing as a mix of grant and loan from the Africa Development Fund (ADF), with the Government of Kenya as the counterpart financier of the project whose total cost in US$130million. 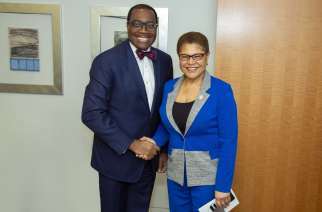 “The Africa Development Bank Group will provide 89.8% financing for the total project through Africa Development Fund (ADF) loan of US$115.9million and a grant of US$5million. We believe that this road will not only reduce the travel time from the current 45 minutes to 15 minutes, but will also transform the socio-economic welfare of the people living along the transport corridor,” the Director said. The road traverses Nairobi’s East and North districts serving an estimated population of at least 2.2 million representing some 70% of the Nairobi County population. Other beneficiaries include users of major city connecting arterial roads of: Nairobi-Thika highway, Eastern Bypass, Northern Bypass, Mombasa Road, and onto the Jomo Kenyatta International Airport (JKIA). Negatu pointed out that the key outcomes of the project will include improved property values arising from reduced congestion, and improved business environment for informal traders owing to access to new market facilities and improved sanitation. Other complementary civil works elements include: 250 market stalls and associated sanitary facilities, planting of 4,500 trees along the corridor, children’s traffic safety park, and 3 Wellness centers for HIV/AIDs and related illnesses. It is further estimated that by improving the existing road, the annual vehicular GHG emission rates in tones in the corridor would drop by at least 70% due to improved average traffic operating speeds along the project corridor particularly, with the integration of the Bus Rapid Transit System as envisaged by the year 2022. “Our approach to this and every project that we have undertaken is guided by our commitment as a Bank to realize inclusive and green growth in Africa. Under this project, at least 500 disadvantaged youth from the informal settlements will gain from artisan training program aimed at enhancing their skills to assure long-term gainful employment thereafter.” Negatu added. The Africa Development Bank previously financed the successful completion of the 50km Thika Superhighway, which was jointly financed by the Republic of China and Government of Kenya. Outer Ring Road project brings to 63 the kilometers of roads financed by the Bank within the Nairobi metropolitan. The African Development Bank (AfDB) Group (http://www.afdb.org) is a multi- lateral development finance institution established to contribute to the economic development and the social progress of African countries. 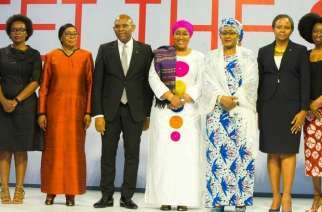 The Bank Group comprises three entities: the African Development Bank (AfDB), the African Development Fund (ADF) and the Nigeria Trust Fund (NTF). 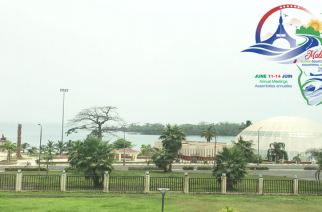 As the premier development finance institution on the continent the AfDB’s primary objective is to assist African countries – individually and collectively in their efforts to achieve economic development and social progress. The Bank Group finances projects, programs and studies in multiple sectors such as infra- structure, agriculture, health, education, higher education and training, public utilities, environment, climate change, gender, telecommunications, industry and the private sector.